Renting a place as a student is mostly fun, but with a tight budget and not a lot of spare time to devote to fixing it up, it's hard to turn the space into the home of your dreams. Hopefully reading week will free up some of your time (it shouldn't because you should be studying, but hey) and you can tackle a few of these simple rental upgrades. 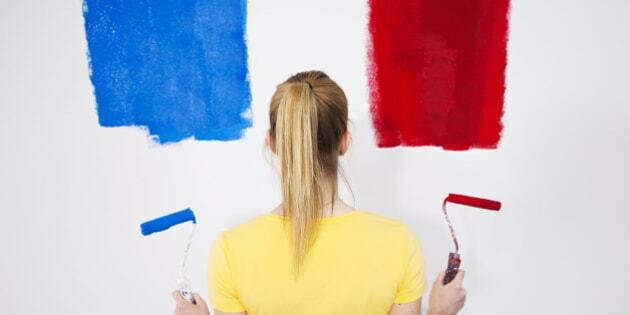 The easiest and boldest way to revamp a room is to paint the walls. Ask your landlord for permission first: some landlords will even pay for the paint if they recognize the need for a fresh coat. If you live with roommates, decide on a colour that matches the overall style of the group. If your landlord doesn't foot the bill, paint and supplies can get expensive so sharing the cost with roommates is best. Plus, painting with friends is fun. Grab a case of beer and make it a fun activity. If you live alone, convince your friends to come over to help and get started! Do you have a Fjellse bed frame like the rest of your comrades? There are easy ways to upgrade it and change around your room. The simplest thing you can do is prop it up on bed risers - this creates storage space under your bed and taller beds tend to look a little fancier. You can buy cheap ones that will do the trick, or choose some that will match your decor. Buy some cheap containers, organize the stuff you've let pile up in the corner and then hide it away neatly under your bed! If storage space isn't what you need, why not take on a DIY project this week and fix up a plain bed frame with a little paint and stain? Reading week is the perfect time to take this on. If you've got an untreated IKEA bed frame like the untreated Farva model pictured below, you won't likely need to sand it down. All you'll need to do is spread out the wood stain, use a rag to work the colour into the wood and you've got yourself a new coloured frame! Then you can use chalk paint to add a pop of colour to your room's decor. For more IKEA hacks, check this out. Do you have the room everyone always ends up in? Make it cozier for you and your guests by adding a few throw pillows to your bed, stringing up lights (not in a childish Christmas lights kind of way, but across the ceiling or around your mirror) and replacing your curtains. If you have the space, floor cushions really come in handy and candles never hurt. If money is too tight for purchases, rearranging your furniture can make your room feel more inviting. Technically your landlord should take care of this but if you're eager and want to do a little something to clean up a slightly grimy bathroom (and if it's okay with your landlord), caulking is the way to go. Fix up the caulking in your bathtub, around the sink and toilet. It will feel cleaner all around and you'll let in fewer bugs. An easy way to upgrade your bathroom is to change your shower head. You can buy whatever kind you like best and it'll make a difference you'll notice every time you shower. You can also install a unique towel rack or stick to a simple (and easy to install) one. Towel racks and shower heads are as cheap as you want them to be and installation is relatively easy. Redecorate with contact paper - even on countertops! Do you have a big, beautiful kitchen that hasn't been updated since 1985? A lot of rental units have this issue - the space is great but the old decor is not. Cabinets and countertops cannot be ripped out by renters, so forget that. They can, however, be updated with contact paper, which is basically a renter's best friend. You can completely revamp the look of your cabinets and backsplashes with this paper, or even change the look of your countertops. You can buy some cool shelving units and install them pretty easily in the kitchen. If you don't have any more wall space, but still need a bit more room, why not pick up some helper shelves this week and create space for more cans or dishes on the existing shelves in your cabinets.